Chris and I went out to Noodlecat for a nice shared birthday lunch. As always, the food was delightful and well worth the journey. But what I really, really love there is the little cartoon that demonstrates proper noodle slurpage technique. Just look at this frame--really look at it. 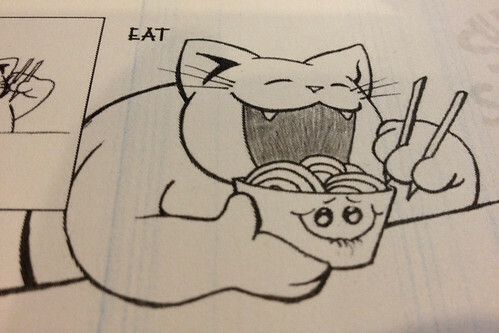 That look on the noodle bowl's face, of the aching, joyful anticipation of the ecstasy of being consumed by a large, chopstick-wielding cat just completely does it for me. I wish I could be as happy about anything as that bowl of noodles is right there in this moment.